1. In a blender, whiz together the garlic, salt, almond butter, olive and sesame oils, and lemon juice until the garlic is finely-chopped. 2. Add the chick peas, parsley leaves, chili powder, and 6 tablespoons of chick pea liquid, and pulse until smooth. Stop the machine a couple of times during blending to scrape down the sides to make sure everything gets well-incorporated. 3. Taste, and add more lemon juice or salt if desired, and more of the chick pea liquid until it reaches a thick, but spreadable consistency. You can make it as smooth, or as coarse, as you want. I, like David, prefer mine mid-way between ultra-smooth and chunky-coarse. Note: If cooking your own dried chick peas: it takes about 1 cup (140g) of dried chickpeas to make 2 cups (350g) of cooked ones. This entry was posted in Blogs and Food Writing, Brunch, Main courses, Recipes Misc, Sides and tagged almond butter, fast, Healthful, hummous, Middle Eastern, vegan, vegetarian. Bookmark the permalink. I’m impressed to see that you’ve managed to post something whilst still travelling! But then I don’t know why I’d be anything less than impressed with you, m’dear. Jax, I managed to post but not respond! I remember your crime-scene of a beetroot hummus. You must overcome your appliance-induced phobias…I’ll have to teach you whenever we wind up nearby in the future. 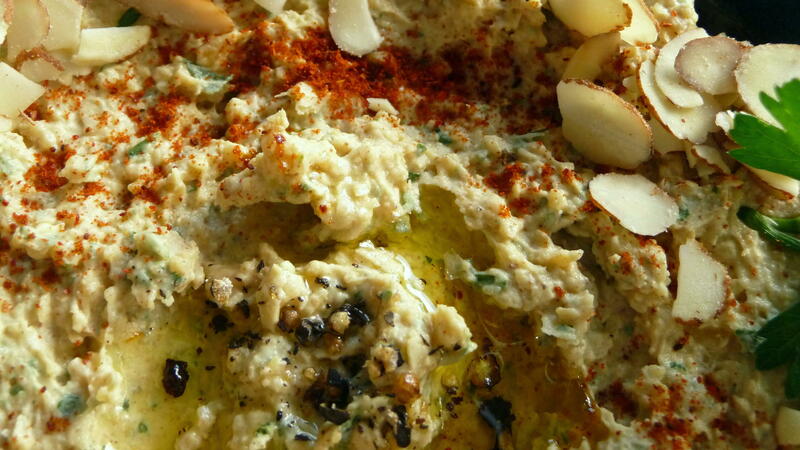 Almond butter hummus sounds quite good! 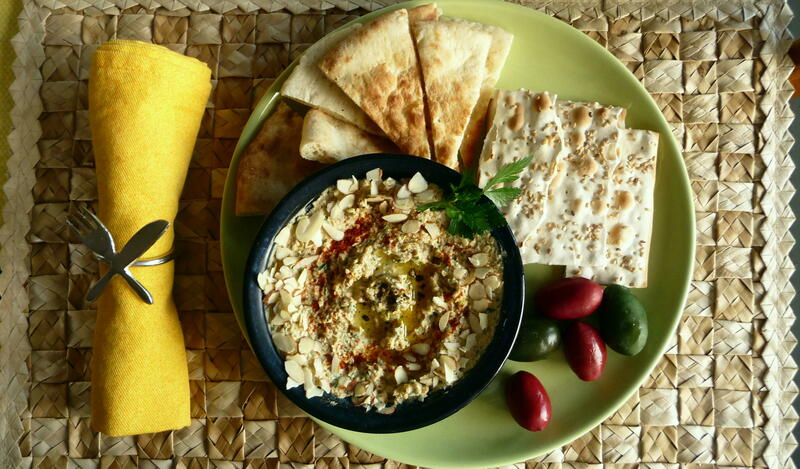 I really like your presentation – the hummus topped with sliced almonds and served with pita, crackers, and olives. Very appetizing! 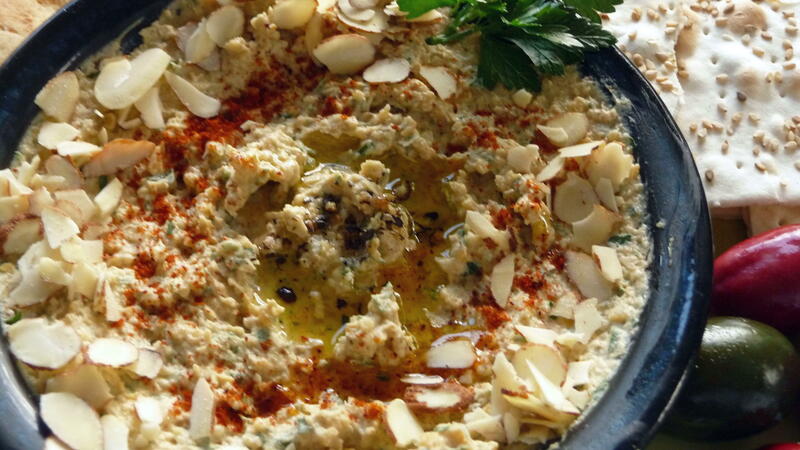 A hummus is still a hummus w/o the tahineh, but technically, a hummus is not a hummus without the chickpeas. “Hummus” = “chickpeas” in Arabic. Palestinians make their hummus with yogurt instead of tahineh and butter in place of olive oil. Is almond butter now commonly found in supermarkets? I remember you had to go to a health food store like Whole Foods or some specialty store to get it when I was still lived back home. Thanks, KM. I’d forgotten the etymology of “hummus”, so that’s good to remember. The variants of dishes throughout the Middle East are fascinating; I once tried the version of baba ganouj with mayonnaise, as the Israelis seem to prefer (lighter in texture but not quite as flavourful). Actually, almond butter is more commonplace than tahini, and I even found a good deal on it at a store here on the island – that’s why I have two big jars! Thanks, Leila, for your additional background on the Kitchen Masochist’s comments. I am a big fan of lebneh and kishk, too. Personally, I think embracing both olive oil and butter is the way to go in life…. What an inventive take on hummus. I can’t wait to give it a go and serve it to friends with maybe a rosemary infused martini. Hm? This looks delicious! Great idea Almond Butter and Hummous will definitely try this great recipe! Thanks for sharing this one.